The WI Quiz Final took place in Hillsborough Village Centre on Wednesday 9th May 2018. The proceedings began with Dorothy Andrews, Acting Chairman of the Magazine and Leisure Sub-Committee, welcoming all and introducing the newly elected Federation Chairman, Collette Craig. The Quizmaster for the evening was Brian Hunter, who not only asked the questions but also entertained everyone with his great wit. After five rounds, a delicious tea was served by the ladies of Drumbo WI. At the end of a further five rounds the teams were all very close indeed. The eventual winners were the members of Myroe WI representing the Roe Valley Area. Many congratulations to Pat Frederick, Jen Mark and Christine Wilson. In a very close second place, only one point behind, were the Slemish Area team of Joanne Carruthers, Elizabeth Gardiner and Alma Suthers from Ahoghill WI. The evening was brought to a close with the presentation of prizes by the new Federation Chairman and a Vote of Thanks by Dorothy to everyone involved in making the evening such a success. 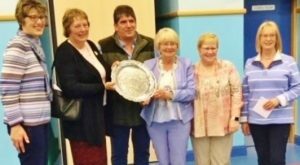 The winning quiz team, pictured with Federation Chairman Collette Craig, Magazine and Leisure Sub-Committee Chairman Dorothy Andrews and Quizmaster Brian Hunter.